Rent a Website The new service from NODETRACK that saves you time and money. The new service from NODETRACK that saves you time and money. Renting a website might be the right choice! If you are a small business or a startup, then you know the struggle of trying to make both ends meet. It is not rare to hear business owners claim that a website would be too much of a cost. When it comes to websites, small business owners, and entrepreneurs often choose to remain in the shadows either due to lack of budget, lack of technical knowledge or lack in human resources. These problems are real and sometimes business owners find them impossible to overcome. Wouldn't it be nice if there was a way to find a ready-made website and lease it? We, at NODETRACK made it happen. NODETRACK offers the option to rent a website for a given amount of time. Upload your own content, give your contact information and increase your income! Take a moment to write us a brief email about the website you need and we will get back with the available options. The Q&A that follows is a helpful guide to NODETRACK's new service. Please read the questions and their answers carefully and contact us if you need further information. 1. What is a Website Rental? A website rental or a website lease is a new type of service introduced for the first time by NODETRCK. By renting a website, you choose one of NODETRACK's ready websites to represent your business online and you keep it for a given amount of time. Similar to renting a furnished flat! 2. 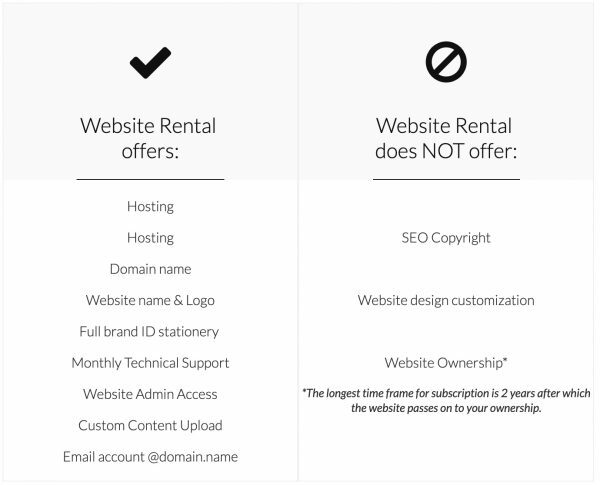 How can you rent a website? This is up to you mostly. You can choose a monthly plan or a yearly plan. Contact us to tell us about your business and help you find a plan that suits you. 3. Who can rent a website? Everyone is eligible for a website rental. As long as the website you want is available, you can rent it! 4. Why rent a website? Website rental or lease is a perfect solution for small businesses or startups with a small budget. This option can save your business both time and money since, instead of building a website from scratch, you choose a ready-made website directly from our inventory. All you have to do is upload your content (i.e. : products, texts, contact details, logo, domain name etc). If you don't know how to do that, we will help you. Every plan includes technical support so you may rest assured that your website will run smoothly. 5. Does NODETRACK offer assistance? Yes! All plans, monthly or yearly, include technical support. 6. Does NODETRACK offer additional rental options? For every website, you may also rent a Facebook Page for an extra cost, if available. We also offer a full brand identity: logo, domain name, business cards and brochures. 7. What is the cost of renting a website? The final cost depends on the type of rental you will choose. For example, long-term rentals, yearly plans, and rentals of more than one item (i.e. : E-shop + Facebook Page) are eligible to discount. Contact us to provide you with a detailed price list on all Rental options. 8. Do we sign a contract? We sign a legal agreement, same as we would do if we rented an apartment. 9. What websites are available right now? At the moment there are 4 e-shops and 3 Facebook Pages available. 10. Where can I see the available websites? We, at NODETRACK are serious about our business. To protect brands' identities and to ensure their prosperity, we chose not to give out their names in public. Instead, we keep them a quiet deal between contractors. You may be curious to find out what these websites look like immediately, but you will thank us for not showing them, later!